I had high hopes for a pre-work day run in Central Park this morning. I'm trying to optimize my readiness for my race on Sunday and I took yesterday as a rest day. I planned on a final training run today before resting again tomorrow. We had rainy weather this morning and while I actually enjoy running in the rain I didn't think it would be nice to spend the rest of the business day looking like a wet dog. As I headed into the office I was disappointed to see the rain was coming down lightly but steady. I figured that I'd have to put off my morning run until later in the day. I made my way over to AG's office and she was already dressed for running. I tried to convince her to run later but she pointed to her calendar which showed meetings throughout the day. She said she was going to run with or without me so I gave in and changed into my running gear. 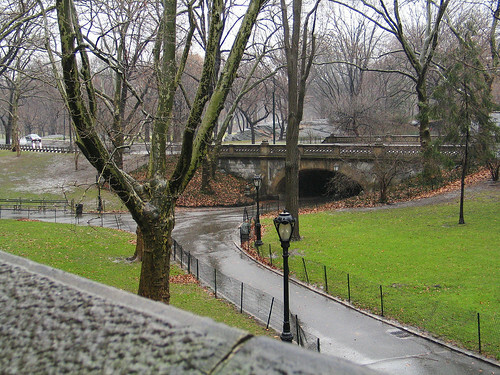 It was rainy as we ran up town to Central Park but the air felt nice and cool. We started our timed run on the south end of the park and did one circuit around the lower loop which measured 1.76 miles. We ran at a fairly fast pace (8:30 overall) and I was happy that I was holding my own with AG - at least most of the time. Lately I've inhibited the pace when we've run but I think running in cool weather in the morning, for less than 2 miles, really helped. With our slower paced run from our office to the park we covered a total of 2.5 miles and it was a great final run before Sunday's 8K. My concern that I'd look spent and soaked for the rest of the day was unfounded and I was very happy that AG shamed encouraged me into running despite the wet weather. I wish I could run in those same conditions on Sunday but the reports are saying 65 and partly cloudy. Come to think of it, that's not too bad either.